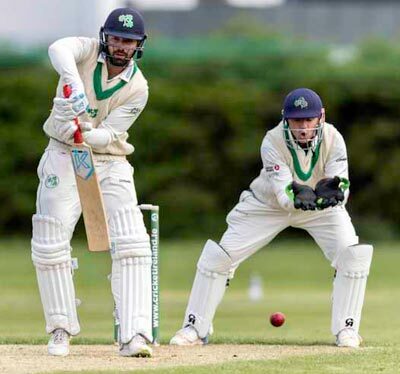 Stuart Thompson led the way for the Irish abroad this weekend as his 87 helped his Wanneroo side to a first-innings win against Joondalup. The Eglinton man struck 12 boundaries in his innings, sharing a third wicket stand of 169 with Australian international Travis Birt who scored 113. Nathan Smith’s 1st grade game continued this weekend. Having taken 2-22 last Saturday, he scored 6 runs today, as his Northern District side had a first innings win over Paramatta. Last Sunday, Harry Tector scored 19 runs in for Randwick Peterhams u21s (his lowest score in his 5 Poidevin-Grey Shield games) before resuming his 2nd grade game against Hawksbury today. Only a partial scorecard has been uploaded as we go to press, but we understand he took 2 catches in the first day’s play last weekend. Hopefully we’ll have full details for next week’s catch-up. Andy McBrine had a good show in a losing performance for Midland-Guildford. Having taken 3-50 last Saturday, he scored 47 runs today batting at 2, however, none of his teammates got past 22 runs in a game that Bayswater Morley had the better of. Jacob Mulder’s return to Perth saw him start a 2nd Grade game last Saturday, scoring 9 runs for his South Perth club against Subiaco Floreat. An incomplete scorecard means we’re unsure if he bowled today - if we get details we’ll put them in next week’s catch-up. Graham Kennedy’s A Grade game for Hannan’s was over quickly today. They bowled Lake View out for 87 in 37 overs (Kennedy taking 2-27), and the young NW Warrior played his part with the bat too, scoring 23 runs as they knocked off their target in 22 overs. Aaron Gillespie celebrated his Wolves call-up for the Sri Lanka tour with 4-30 in his 10 overs against North Albury. In the second innings, he top-scored with 32 runs (batting at 3) to help his Albury Cricket Club side to a 2 wicket victory. Cormac McLoughlin-Gavin’s Lisarow-Ourimbah side played the first day of their 2 day game against Kincumber in a low scoring game, for the first day, at least. Having dismissed Kincumber for 51 (both opening batsmen caught by the Irishman), his side may have hoped it was over as a contest , however, they were themselves bundled out for 91 in what, one presumes, were not bat friendly conditions, McLoughlin-Gavin scoring 7 runs off 57 balls. At today’s close of play, Kincumber were 12-1 off 7 overs, with it all to play for next week. Aditya Adey played in the Orange District Bonnor Cup today. He scored 21 runs in the T20 game, before taking 1-21 in his 3.1 overs, however it was not enough as Cavaliers beat his Bathurst City side by 4 wickets , with 5 balls to spare. Niall McGovern’s North Eltham side started day 1 of their Barclay Shield match against Plenty Cricket Club today. He scored 14 runs batting at 2 as his side finished the day 188-8. Michael Cotter’s Roy Picone Shield game (effectively 3rd Grade standard) started last week was abandoned without a result. There was also a washout in Tauranga which left Jonathan Waite and James Metcalfe twiddling their thumbs. Diarmuid Burke was one of a number of Scarborough u15 bowlers who struggled today, on resumption of their game with Rockingham Mandurah, his 8 overs going for 0-30, as their opponents prevailed. Leah Paul scored 4(26) when opening the batting for her Ringwood side against Plenty Valley, the latter running out 3 wicket winners. Sophie McMahon played her part in two T20 victories last Saturday for her Gordon Womens Cricket Club. In the first, against Universities Blue, she scored 15 runs and took 1-21 with the ball, in the second she took 1-21 against Bankstown Sports. Many thanks to Ian Muldoon who alerted us to a scorecard that wasn’t up at the time we went to press last week. In Victoria, Preston were struggling after losing three early wickets, including Eoghan Delany for 18. Fionn Hand was in next, and he scored 51 in a century stand for the fourth wicket. His side finally reached 210. Then Fionn opened the bowling. He finished with 3 for 44, and help dismiss opponents Croydon for 117. Again, thanks for reading, and if you have any details of games or players not mentioned, I’d be grateful for any info - contact me at @dotski_w on Twitter.